After the A4 opening I reported about in the last post, I didn't work anything until June 8th. Janne OH5LID had planned a trip to activate several squares on 4M and 6M. I was lucky enough to work him on JT6M on June 8th from KP17. That was my first new grid thanks to Janne. June 9th gave me EA8MT in IL27 and EA8/DL3GCS in IL07 for two new grids on 6M. June 10th gave me 2 x 4X stations and SM/OH5LID in KP06 for my second new grid. The muf increased to the point that 2M suddenly opened. I don't have a yagi up, but I connected my vertical and managed to work OE3FVU JN78 And HA1FV JN87 on 2M SSB. JN87 was a new grid for me. June 11th had a 6M ES opening to UY, YO, LZ, YU, OM, SP, HA, I and 9A. I finished the day with SM/OH5LID in JP94 and JP85. Janne gave me yet another 2 new grids on 6M. I only worked one 6M qso on June 12th, and guess who, Janne again! SM/OH5LID was worked from JP84. In only a few days, Janne managed to give me 5 new grids on 6M. Thank you very much for the expedition and the great job you did! 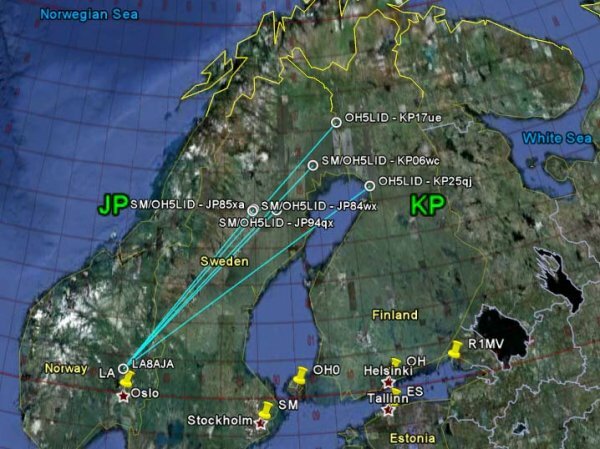 I finished Janne's trip on June 13th with OH5LID in KP25 on 6M. That wasn't a new grid, but I had only worked it once before. Janne was in fact quite easy to work from all locations, however I didn't expect to work him from all those grids. Read about Janne's trip here. You might also want to see the most wanted grids on VHF/UHF or even submit your needed grids here.